Jackie Watson, USA and I would like to win the Contest #3! I would like to enter contest #3, the friendship shawl. I love this pattern. It is very creative and so different from any shawl pattern that I have seen. Thanks for the opportunity to win. Thank you. My mom loves the shawl design as well and has asked me to make one for her. That’s probably one of the highest compliments I can get as a designer. Lynda hdez, Belgium, and I will like to enter contest 3, that design is gorgeous! I’d love to win contest #2!!! I love Tunisian and this stitch pattern is lovely. I’m Darlene P. from the USA! Thank you for offering this giveaway!!! Thank big yarn companies like Cascade Yarns for offering such great free patterns. They pay me for the design work, but offer the patterns to crocheters and knitters for free. Cascade Yarns deserves a lot of credit for investing in a wide variety of beautiful crochet patterns over the past several years. Thanks, Jessica! I also did a photo tutorial for this stitch on this blog site, to coach you along on making the stitches. If you can do Tunisian Simple Stitch, you should have no problems making this scarf in the future! I’d like to enter contest #3. I’m Ana Luisa from Mexico, thanks! Sorry, I made a mistake, I meant to write contest # 1, please. Okay – got the change to contest #1! Love them all but especially the shawl! Glad to have “discovered” you!!! Wendy Napier, USA I love the shawl, I’ve already added it to my wip folder, If I don’t win that’s fine, I’m making it even if I have to get the yarn myself. It’s beautiful! Wendy, I’m assuming you want to enter Contest #3 then?? I would love a chance to win contest # 2 the Esme Tunisian Scarf. Thank you for this opportunity to celebrate NatCroMo 2016! Your scarf, cowl, and shawl designs are gorgeous! Today’s post is fun, too, with a bit of insight into how you design and collaborate with other fiber artists. Please enter me in Contest #1. I love that colorway and stitch pattern. I’m Liz R. in the USA. Thanks again! I love that blue-green colorway, so I’ll enter #2. I’m Kris, from the US. I live in the United States. I would love to win contest #2! Mary Sweeney US – Contest #3 please! I’m Kris in the US. I love that blue-green colorway, so I’d like to enter #2, thanks! I love them all! But I’ll choose number 1. Would love to win #2. Just bought my first Tunisian hooks. Learning Tunisian is on my list to learn this year. Thank you for the contest. I wish to enter contest #3 for the Friendship Shawl signed pattern and yarn. I love the elegance of the design. I’m Ann in Seattle, WA, USA. I’d love to win #2 Esme or #3 Friendship shawl as both are made in yarns free of animal fibers that I haven’t used before and both patterns are gorgeous. Ann, since I am trying to make even odds for everyone, could you please choose which contest you would like to enter? Thanks! Your designs are so elegant! I love, love the colorway of yarn in the Tara shawl. 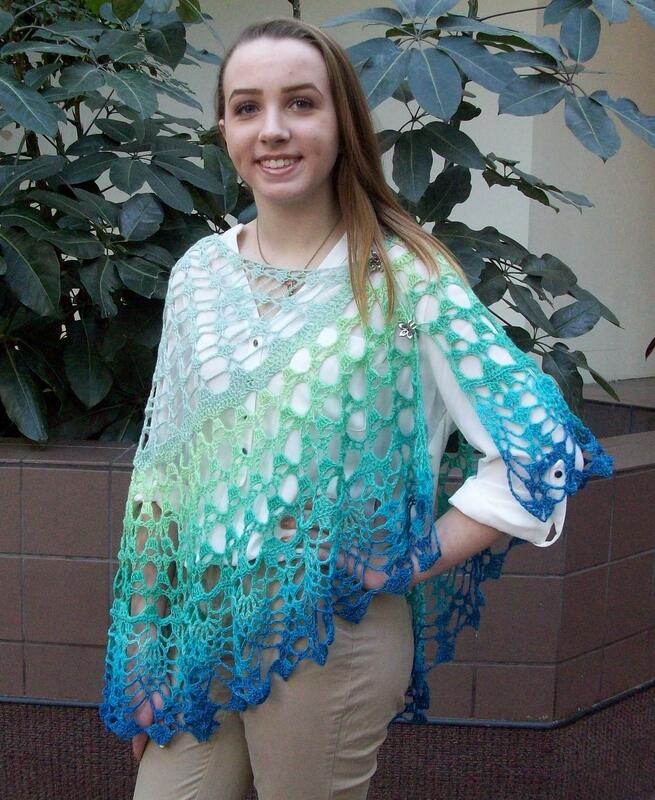 I would like to enter contest #3…I’m a shawl addict. Thank you for your comments. Julie and I had lots of fun putting this colorway together. The first color we chose was that ending deep blue, and the progression went from there. Hi, I’m Nora and I live in the USA. They are all so pretty it has been hard to decide, but after narrowing it down to the Tunisian scarf and the shawl I finally decided I would like to be entered into Contest #3 for the shawl please. (I figure this is a good idea since I have never done Tunisian crochet before.) Thanks for the chance to enter this contest. I also have to say your Terra Shawl is stunning. I just bought the pattern and ordered the yarn from HGL. Thank you! Thank you so much for purchasing the shawl pattern. I appreciate it a lot!!! Adrienne is requesting Contest #3, please; USA. Such a luscious pattern!! Thank you for offering it! Hello! I’d love to try Tunisian crochet, please enter me in contest #2. Thanks! I’d love to win the yarn to make the Friendship shawl! Beautiful! I would like to enter in contest #3 and I live in the United States. Thank you for a chance to win. Your patterns are awesome. I’m Michelle Wulf from Alaska, USA, and would like to enter for #2, please. Thank you for your generosity! Laura, your designs are beautiful. My name is Robin Delano, I am from the US and I would like to enter contest #2. Thank you for your generosity. I am Christiann from the US of A. I would love to enter Contest #2. 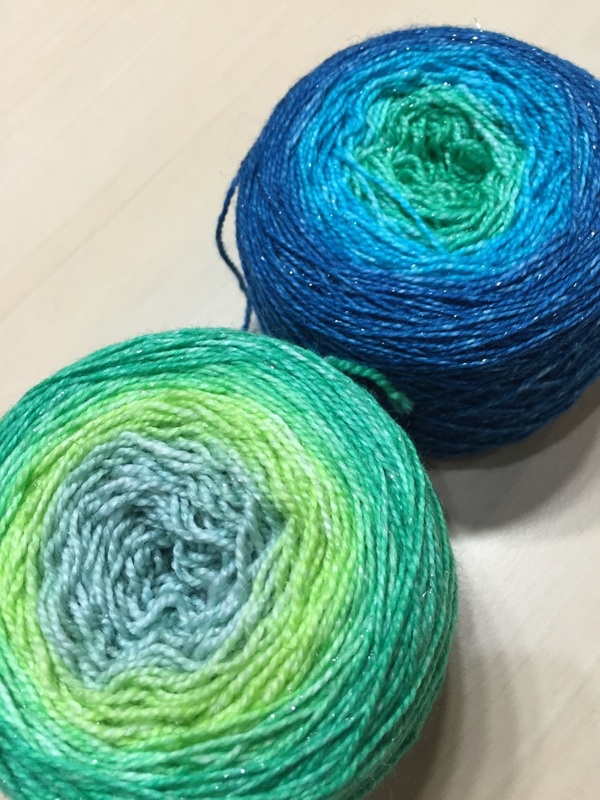 The blue-green yarn is great and works up beautifully in the Esme Scarf. I am Sarah, from USA. Please enter me in contest 1. I love the color & the pattern! I am entering Contest #3 for the Friendship shawl. I have been a follower of your designs for Cascade: your style is recognizable! I especially like that you often have a center section that is shaped. I had been aspiring to make the Gemstones shawl, but the new Terra design is even more me — I better get started! Thank you so much for your generosity and support of NatCroMo! Thank you so much for your kind words about my Cascade patterns. I like trying different shaping techniques with shawls, and that center wedge panel creates just enough of a curve. 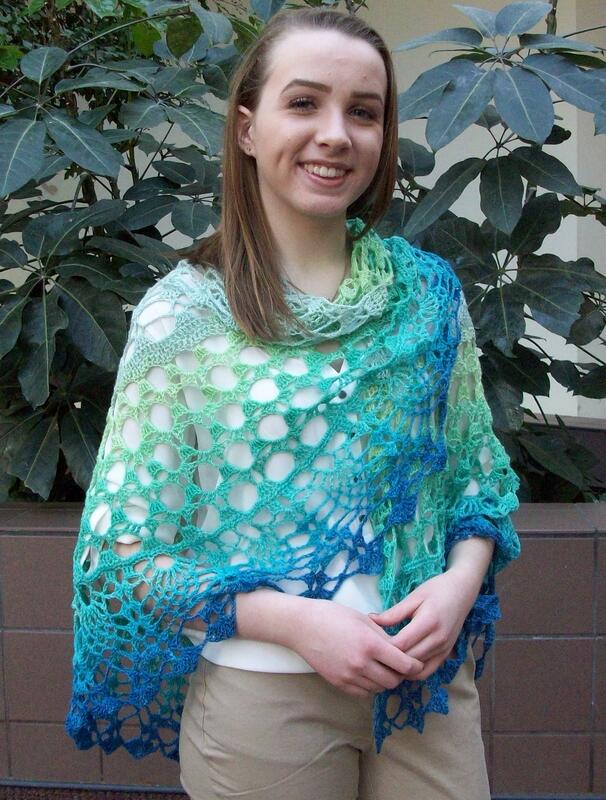 As for the Terra Shawl, it was a lot of fun to design. Once I decided I wanted to change up the stitch patterns in the shawl, I knew I wanted to end with the pineapple stitch. There was a bit of stitch and rip going on to make sure I would have enough yarn to finish the numbers of rows I needed for the stitch. I can’t wait to see other finished versions of the pattern. I’m Sumi from the US and I would love to be entered in the drawing for the Friendship Shawl pattern. Jessica Garrison, USA, would like to enter contest #1. Love that color and scarf pattern. I will like to enter contest # 2. I’ve never crocheted using the Tunisian pattern. Tampa,Fl. I would like to enter the contest for the Friendship scarf. I love the color, and the design is beautiful. Thank you for the giveaways! Your designs are beautiful! I still have time to enter contest #3 from Indiana.